We arrived in Florida last night for one of my high school friend’s weddings and I’m so excited to plant myself on the beach today and tomorrow. WARMTH! One of our other friend’s parents have a condo right in Clearwater near the wedding so all of us staying there are so way thankful for their generosity – we have gotten very lucky with having parents who welcomingly host us, making all this travel possible. Maybe one day in the way far future we can do that for our kid’s friends…saying our kid’s sounds so weird. We hope one day, but no we ain’t pregs. Ok now I’m rambling. Moving on. Our plan for today includes going on a beach run, getting some color (I’ll still have spf 30 slathered everywhere), reading and napping and then we have dinner reservations tonight. Should be a fun + relaxing warm getaway after a few months of New England winter. I’ll be back tomorrow with another post and then Monday with a recap. In the meantime let’s roundup some tasty eats from the last few weeks….sound good? All I ate was toast for a lot of days in a row. I’m still on the toast kick here and there, but eventually my tastebuds got bored and I started switching it up. 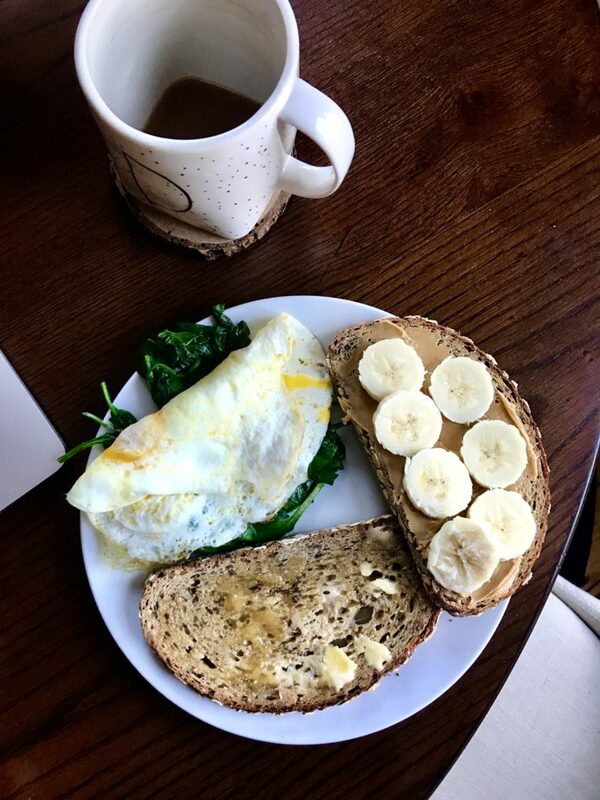 This was Iggy’s multigrain bread with butter + honey and banana and pb plus two fried eggs over spinach. English muffins in the house! Love those nooks and crannies. 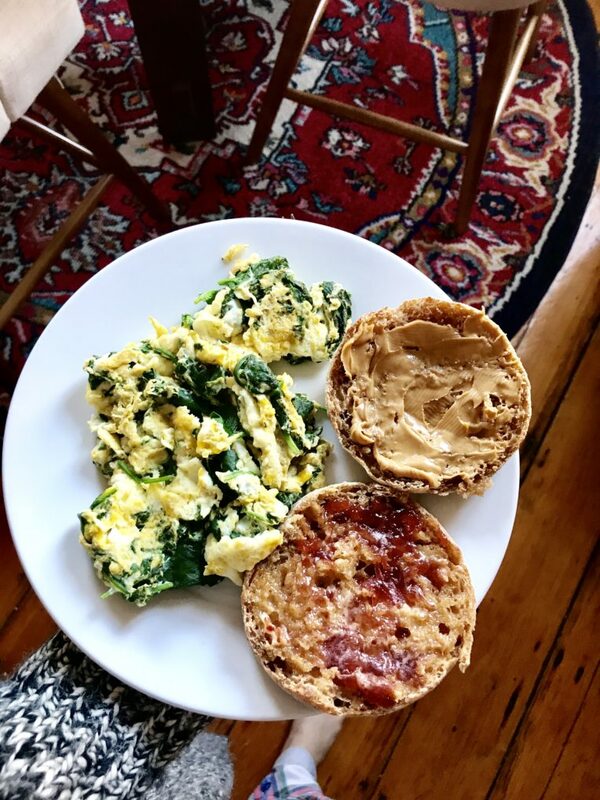 Scrambled eggs and spinach with pb on half and jam + butter on the other muffin half. Went with a sweet + savory combo one day. 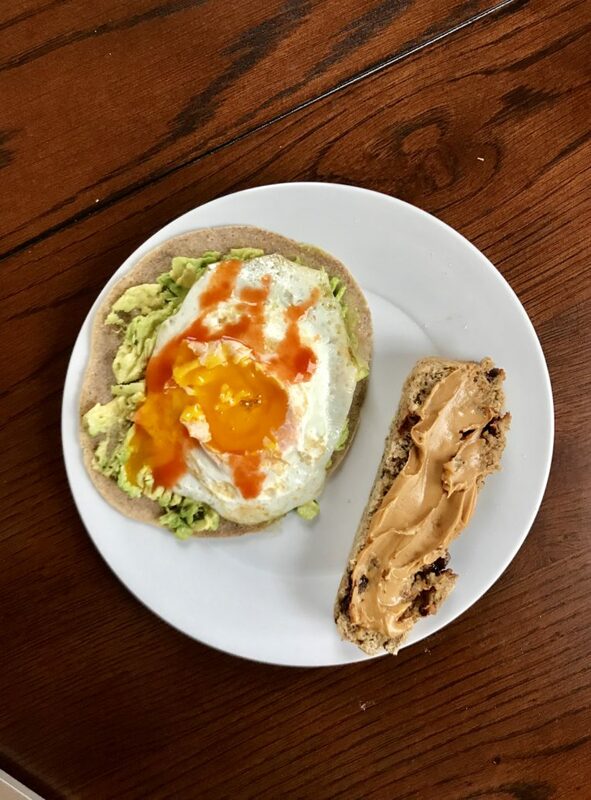 Avocado, fried egg and hot sauce on flatbread plus a thick slice of chocolate chip banana bread with pb. 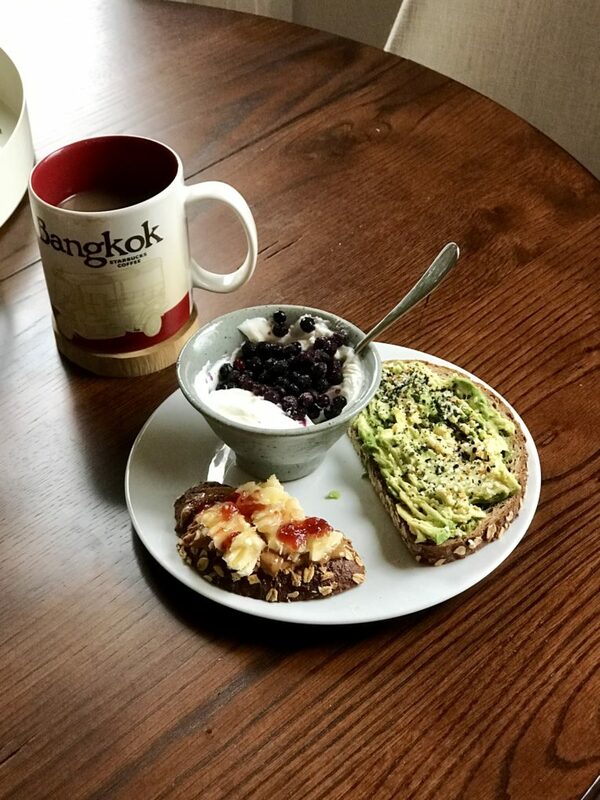 More Iggy’s toast – half with avocado and everything seasoning, half with pb + mashed banana + jelly and whole milk fage greek yogurt + blueberries. This was super satisfying. Blueberry oatmeal! Made on the stovetop with almond milk, vanilla and a pinch of sea salt. At the end I stirred in a chopped date, a handful of shredded coconut and topped with peanut butter. 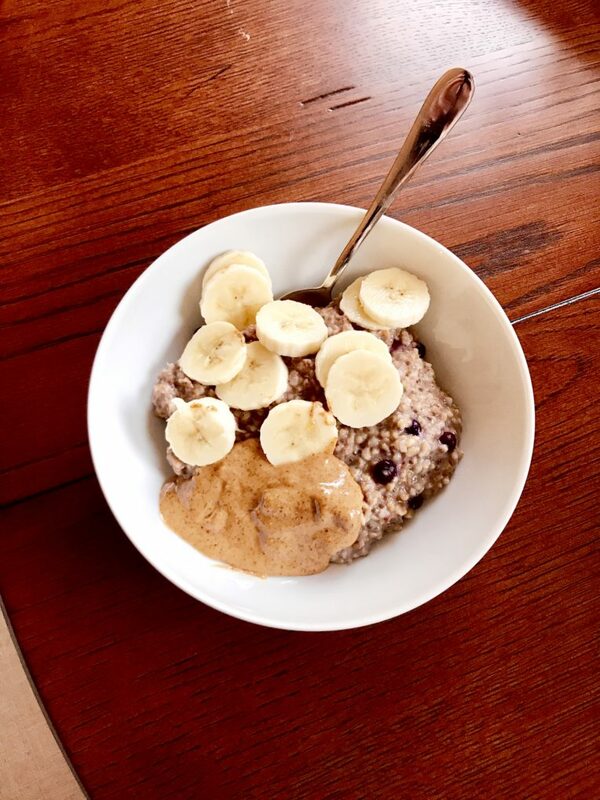 Steel cut oats have made a comeback since I bought them last week and I love the chewier, heartier texture. This peanut butter chocolate chip bowl with banana was dreamy. 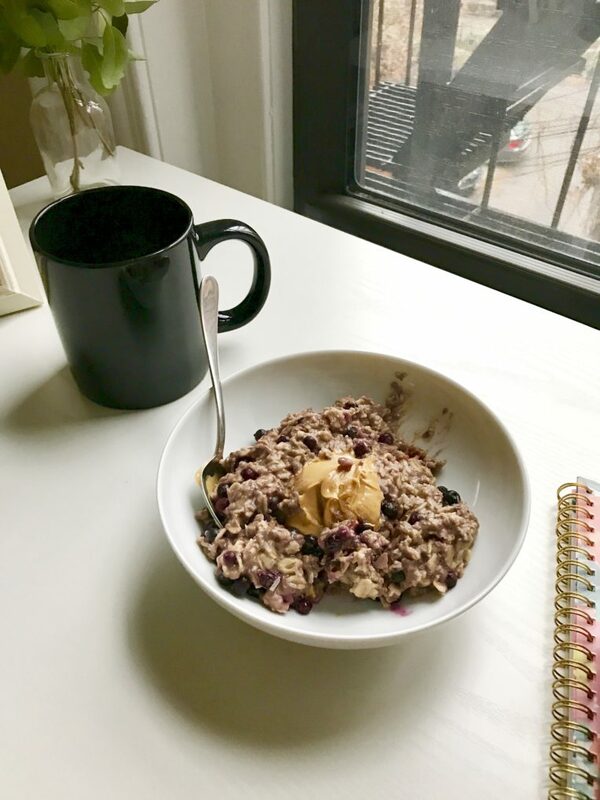 Another day of steel cut oats – plain oats cooked in almond milk with a pinch of sea salt + blueberries, banana and almond butter. 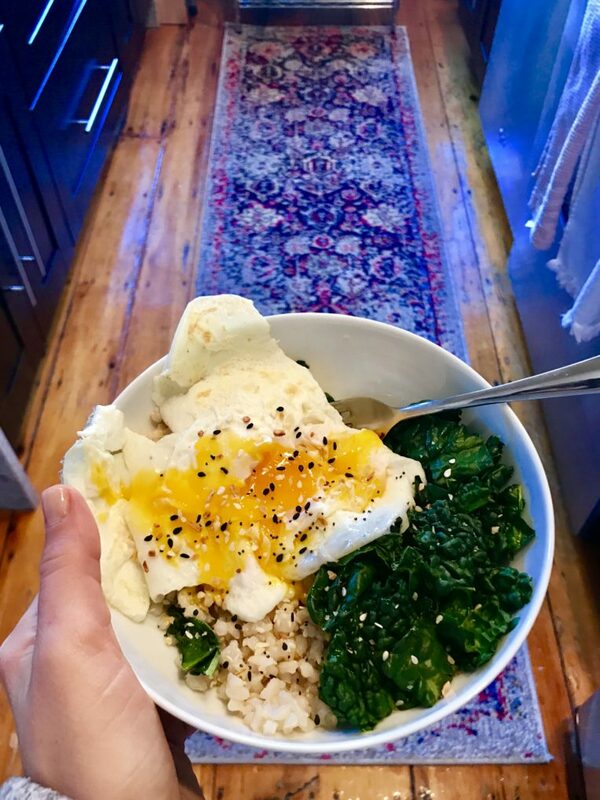 And I went 100% savory yesterday morning with leftover brown rice heated up with butter + sea salt and then added some steamed kale and two fried eggs. I ate a banana + almond butter mid morning. 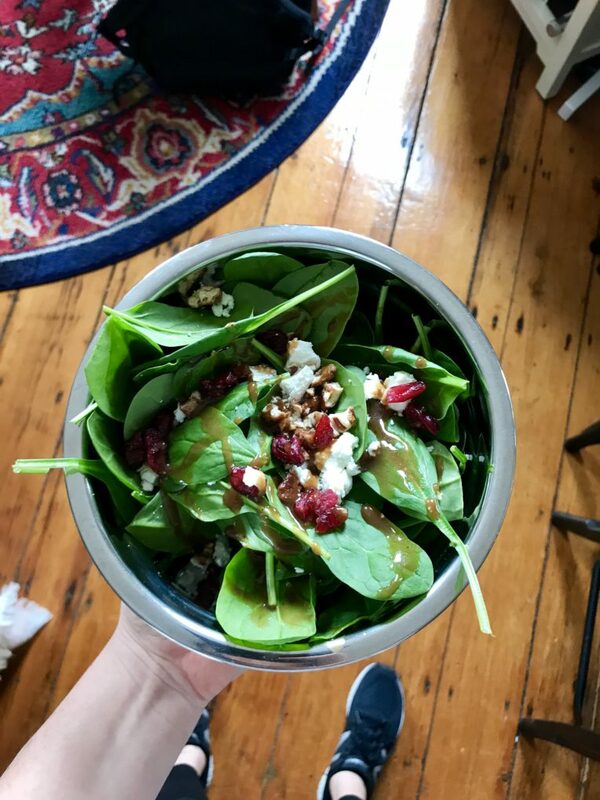 My favorite combo this week is spinach with goat cheese, candied pecans, cranberries and balsamic vinaigrette. I’ve been eating this salad with either pita + hummus or rice cakes with cottage cheese and some TJs everything seasoning. 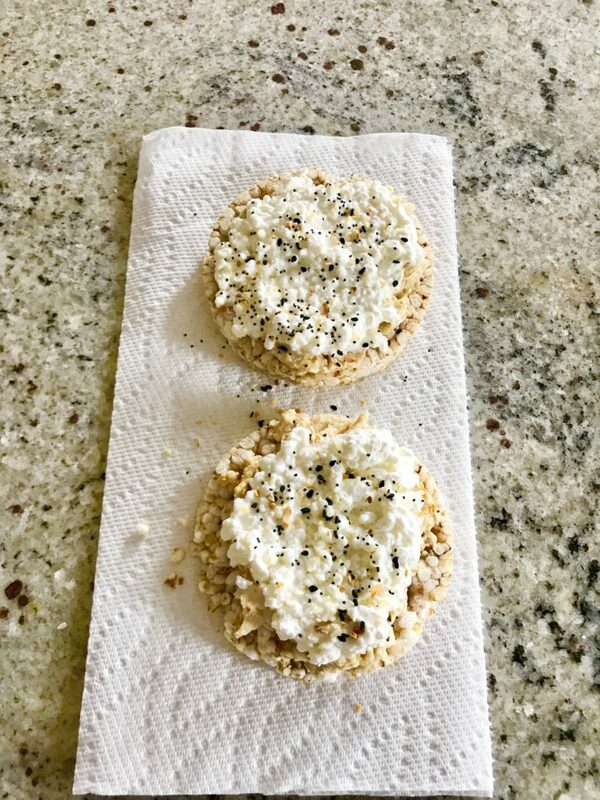 That sounds random (and weird actually) but I was talking to a client about cottage cheese one day and incorporating it back into her life and I was like wait…I forgot about that and how much I love cottage cheese! Bread is too soggy and we were out of crackers so rice cakes it was. 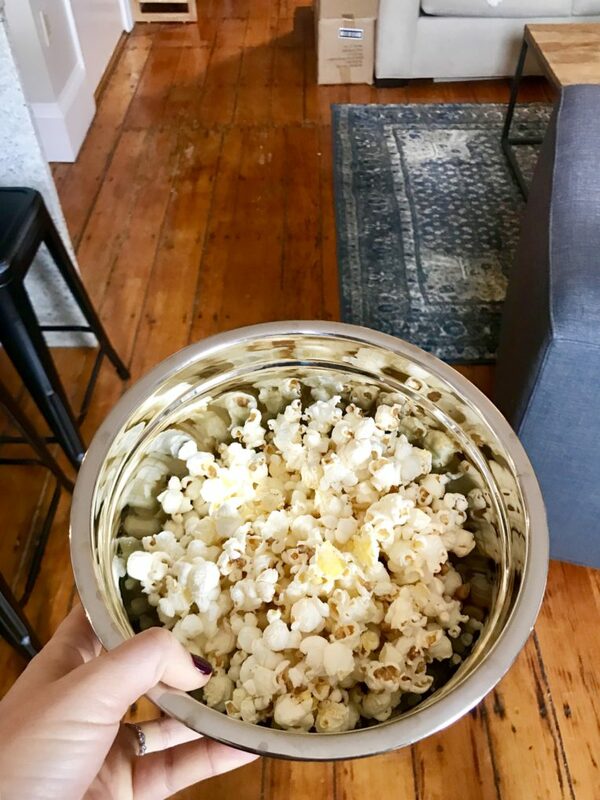 I might always eat my cottage cheese like this – it was fab. Last Friday I got lunch at Flour with one of our interns, Hannah. 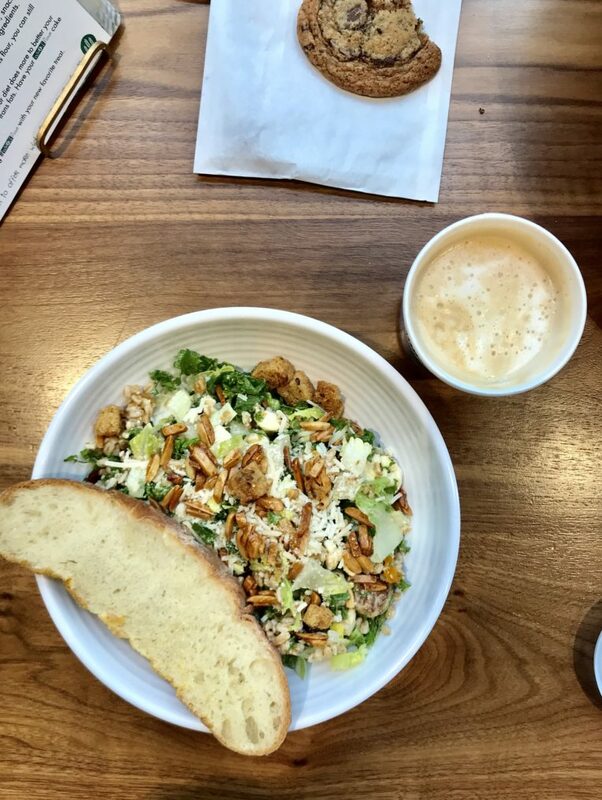 I ordered the farro and greens salad that has roasted nuts, cheese, croutons, cauliflower, brussels and dried fruit. It’s always good. Plus a latte and some bites of chocolate chip cookie. 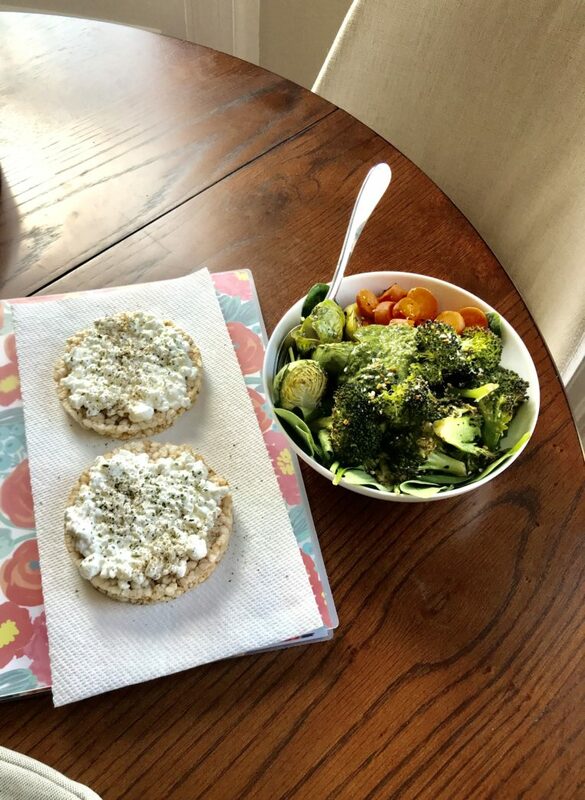 Last week I paired the cottage cheese + rice cake combo with a roasted veggie salad topped with pesto. Just roast broccoli, brussels and carrots in oil at 400 degrees until tender. I store them in the fridge to have all week. Then microwave over some spinach and top with TJs pesto and you got a winter salad. 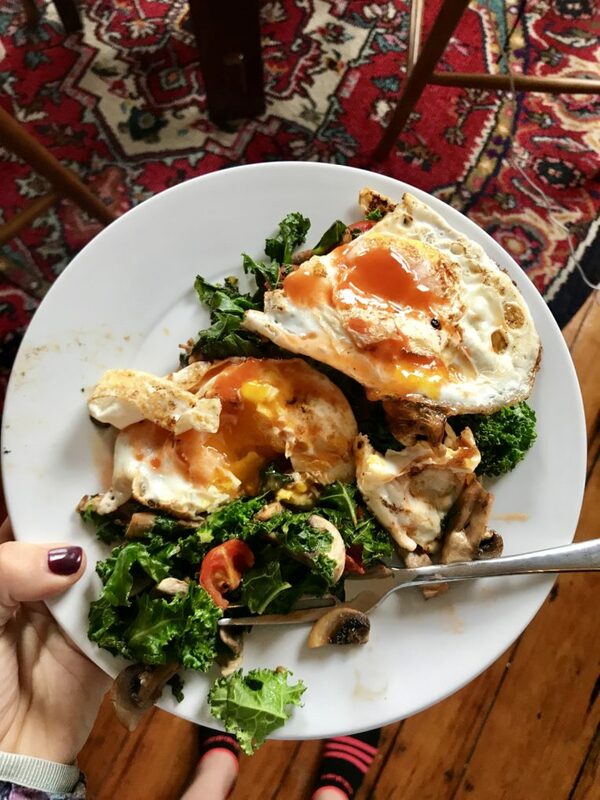 At the end of the week I was cleaning out the fridge and sautéed leftover veggies (kale, mushrooms and tomatoes) topped with a couple fried eggs + lots of hot sauce and popped some popcorn on the stove for carbs. Last week I took this tupperware to the library. Banza sent me their chickpea pasta to try and I actually really like it because 1) it’s not mushy 2) it doesn’t taste like beans and 3) it makes putting together a meal with protein, carbs and fats so easy. I like regular pasta just as much as this but they go with different things. I’m not sure I’d make alfredo or baked pasta with banza. But this is a fun mixup and it was easy to throw together this lunch and know it would satisfy me. 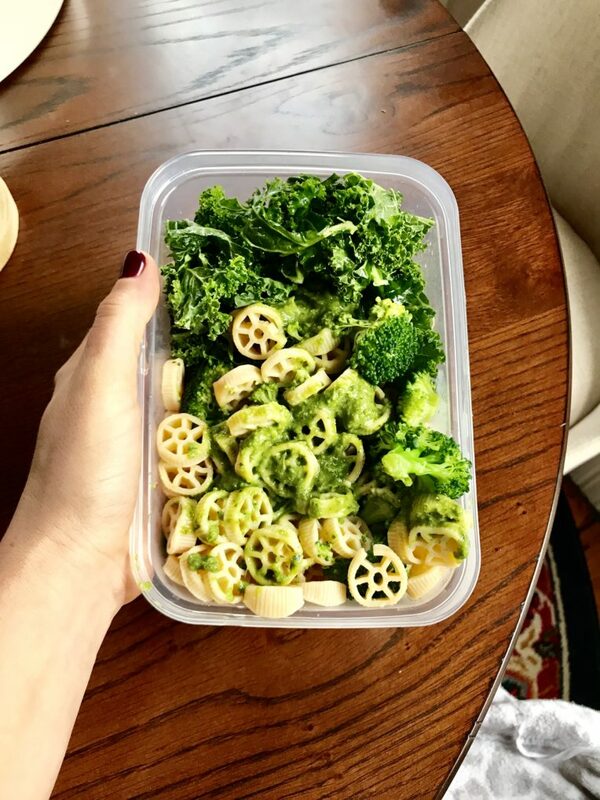 Bean pasta for protein, kale and steamed broccoli for micronutrients, pesto for fat and I ate crackers and an apple on the side for carbs. 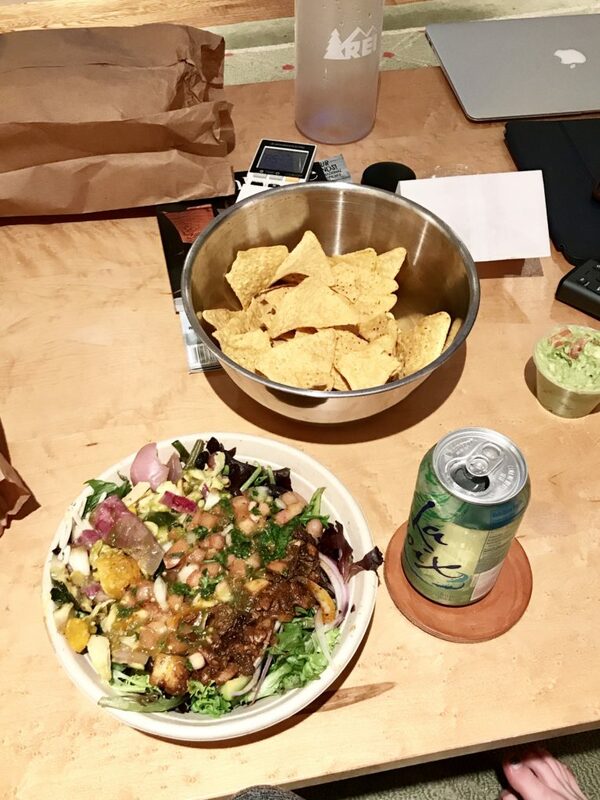 This photo is from a couple weeks ago when I took leftover nacho ingredients and made tostadas. Corn tortillas (broiled until crispy) topped with refried beans, guac, tomatoes, salsa, green onions, nacho cheese and sour cream. Plus spinach salad with apples, goat cheese and dressing. I don’t have many dinner pictures. Mainly because we ate the same thing over and over again and I forgot to snap pics because the lighting is always crappy at night. 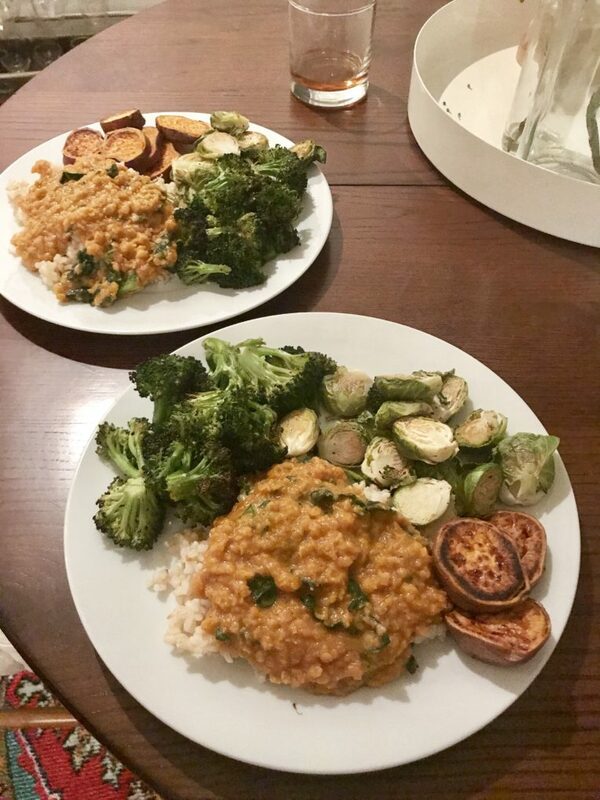 This week we’re eating red lentil dal over brown rice with roasted veggies – broccoli, brussels and sweet potatoes. A couple weeks ago I had my first Anna’s Taqueria experience. Apparently this is a Boston thing. It didn’t disappoint with a burrito bowl (roasted veg, beans, cheese, some spicy pork, rice and guac) but next time I’m definitely getting the burrito. Chipotle is for burrito bowls. Anna’s is for burritos. Perfect bars are the snack bar I choose when I’m “meal” hungry at a coffee shop and won’t be home for a couple more hours. They are way more filling and satiating than a Larabar or other granola bars and I like that. 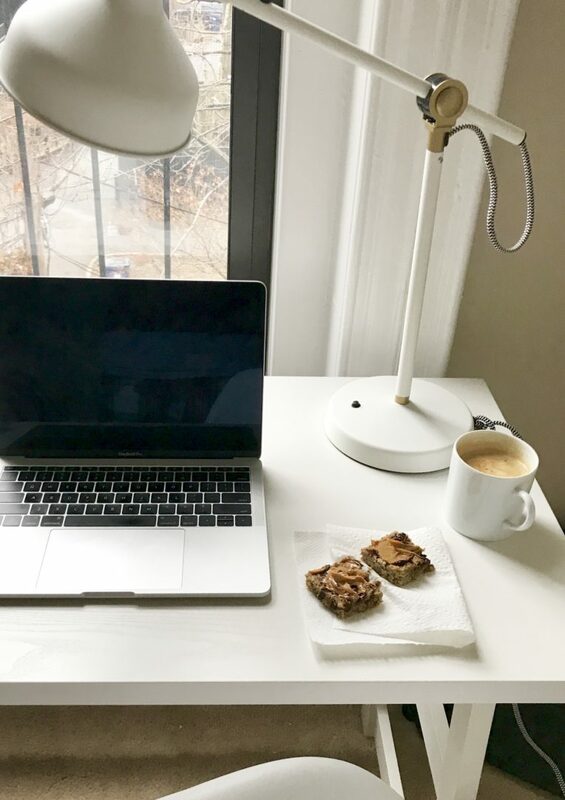 Banana bread with pb and a latte – aka I use our Nespresso and heat up whole milk – it’s my go to when I’m seeing clients at home all morning. 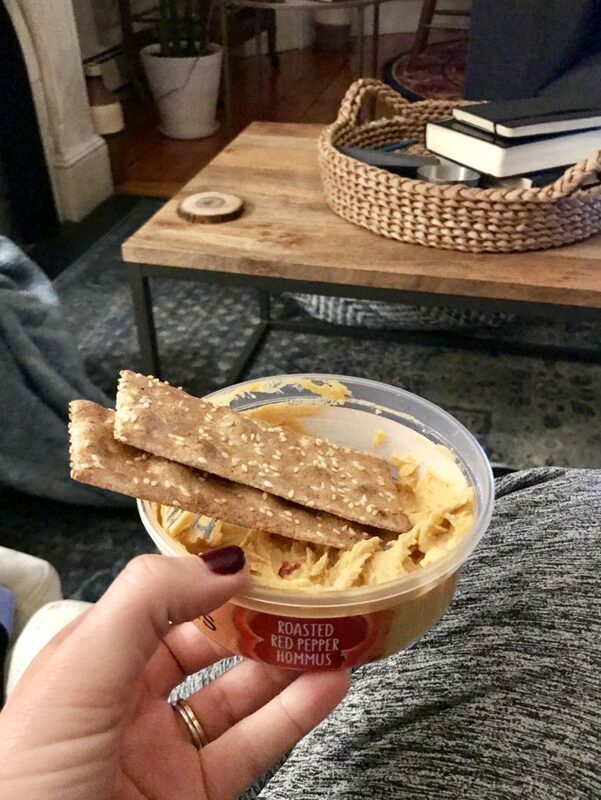 Crackers (these are Ak Maks from TJs) with hummus before dinner to tide me over but not get me too full. 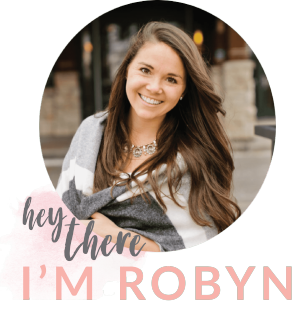 Dates with peanut butter and chocolate – I forgot about you! 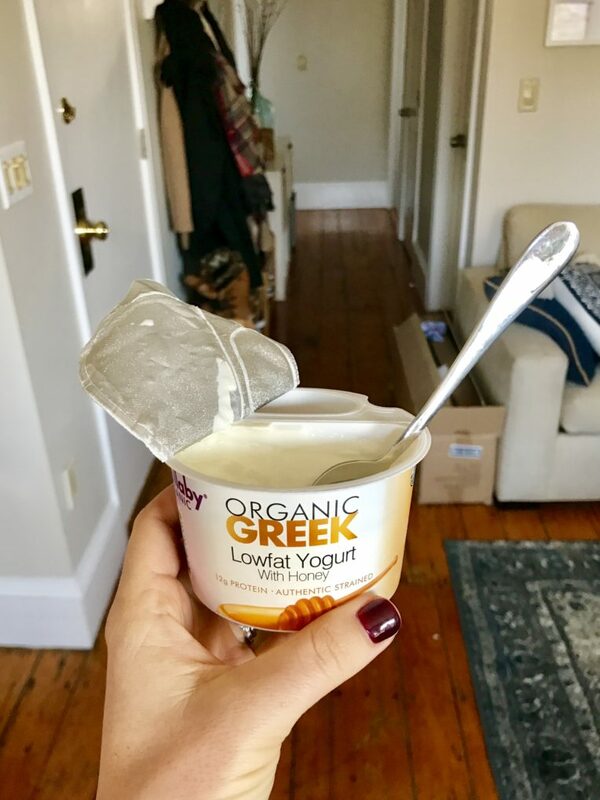 I wish Wallaby sold these honey greek yogurts in the whole milk variety. But this was tasty nonetheless! 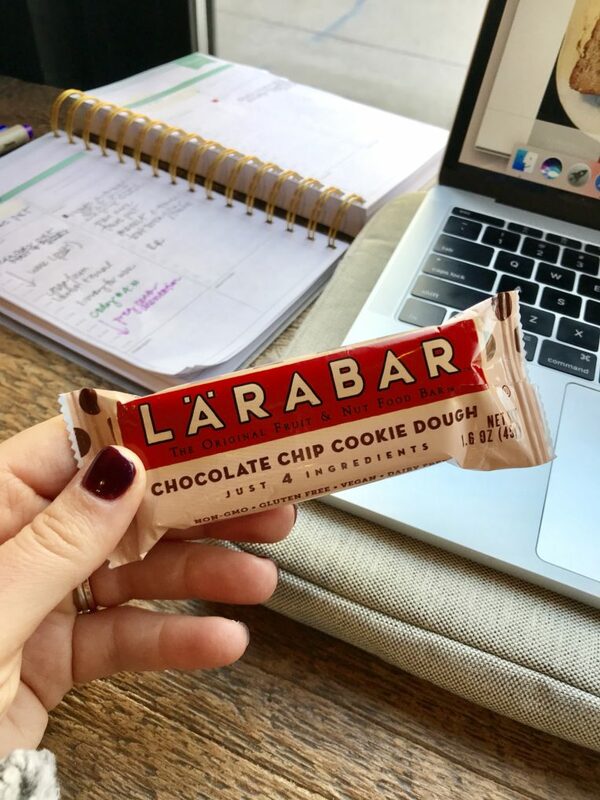 Second favorite Larabar right behind peanut butter chocolate chip. 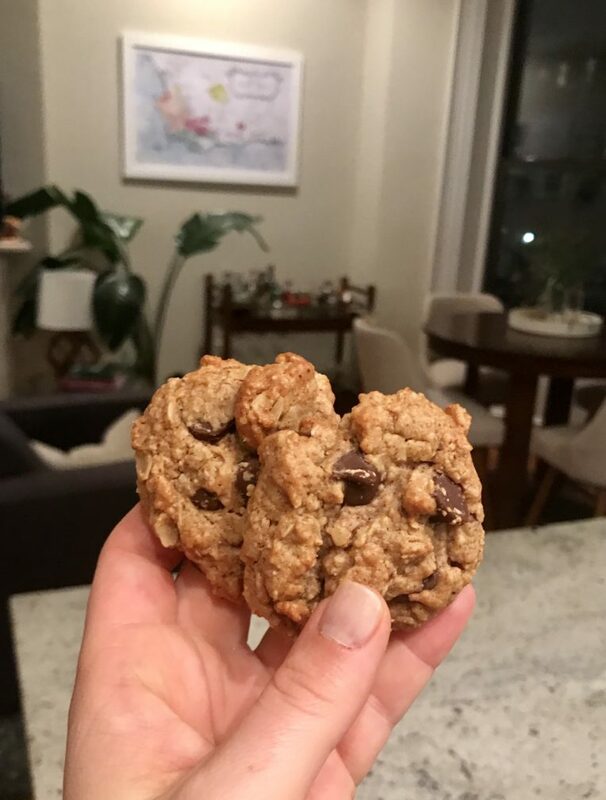 And I always have some sort of cookie in the freezer – these chocolate chip cookies are THE JAM. I used a regular egg and regular butter because that’s what I had on hand. And you guys know there were many nightly bowls of ice cream for a bedtime snack (sometimes with above cookies) over the past couple weeks. 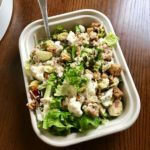 I hope these eats inspired you to give your tastebuds something new to try as you discover what satisfies YOU. 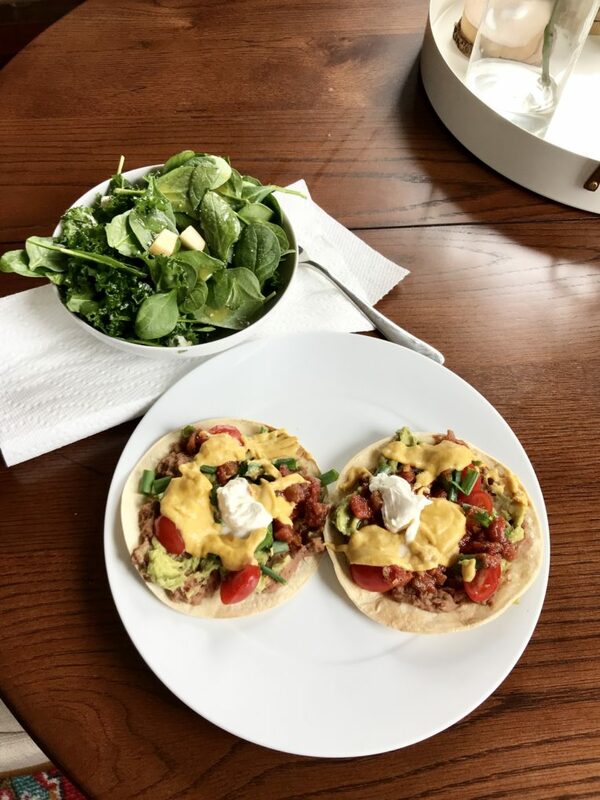 Love seeing your weekly eats! 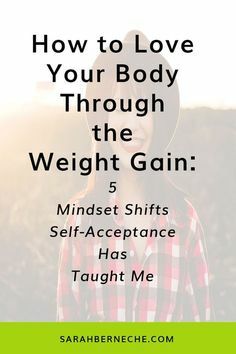 I get so much inspiration and it encourages me to eat intuitively and listen to my body! 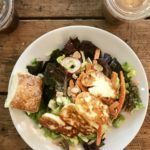 Love see weekly eats! It gives me inspiration to mix things up. I have a question, why do you prefer whole milk yogurt over others? 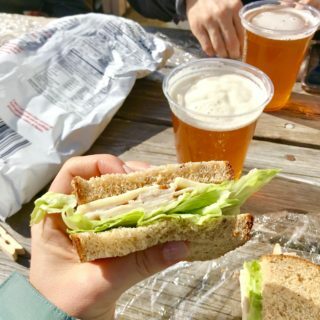 Is it for the taste, or are there other benefits to it? 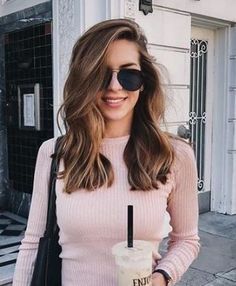 Taste definitely! But also full fat dairy is better for women’s reproductive health. When you strip dairy of fat (estrogen is suspended in fat) you are left with a higher testosterone (which is suspended in water) and lower estrogen dairy product. This article is interesting showing full fat dairy vs low fat dairy’s effect on ovulation. Wow. I totally forgot that cottage cheese even existed. I LOVE that stuff. It’s been too long. Love the rice cake idea! 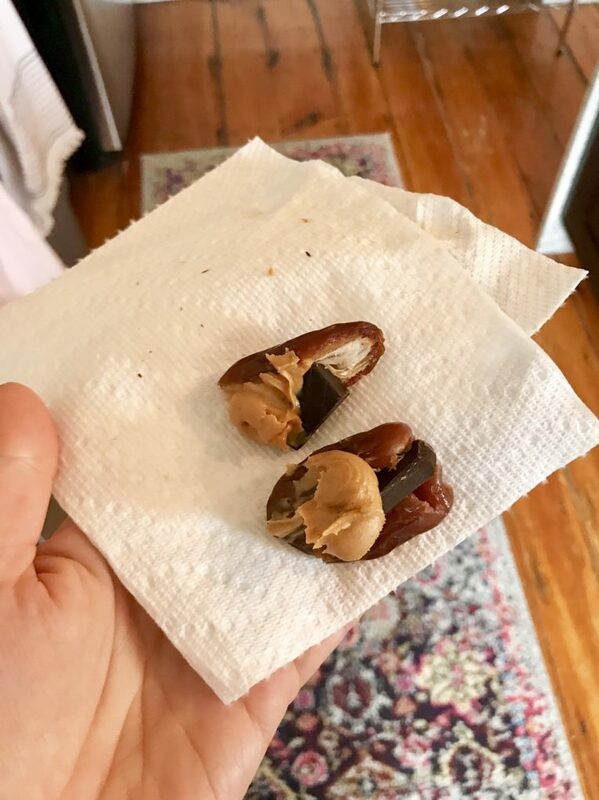 Dates + pb and chocolate is a winning combo! 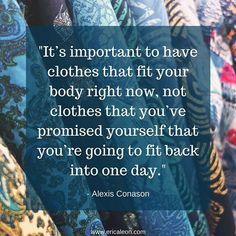 I did too until a client mentioned it! So funny about your cottage cheese kick! My mom used to eat it all the time when I was a kid and I thought it was gross, but now I can’t get enough of it! I’ve been eating it almost daily for the past few weeks. I have never thought of the cottage cheese on rice cake combo. I’ll have to try that! 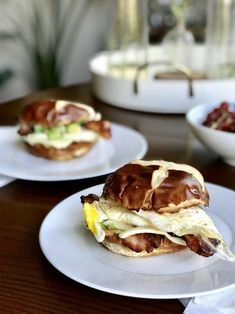 These eats look so good! I hate that most of the cottage cheese and Greek yogurt I find is low/nonfat, but I’ve reliably found the most delicious whole milk cottage cheese at Whole Foods (it’s pricey), and I cannot get enough! I used to think I hated it because it honestly looks so unappealing, but I love it, especially with granola and roasted sweet potatoes or caramelized bananas. Oh yum will have to try with granola! 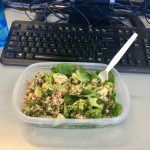 Love seeing your weekly eats! Moving across the country in a few months and determined to finish up all of my pantry/condiments and seeing what everyone else eats is really inspiring me. How does the chickpea pasta compare to TJ’s lentil or black bean pasta (if you tried them)? I guess I’m mostly asking how the pasta is once it gets a bit cold. Love the lentil and black bean stuff when warm but even a little cold and the texture becomes super powdery and brittle. Yaaayyy healthy fats! (Forgive my excitement, I used to be so scared of fat and now I’m a butter, avocado, nut, and cheese eating fiend). Such fab inspiration. Ahh so much good food here! I am making tostadas for the first time tonight and am pretty excited. 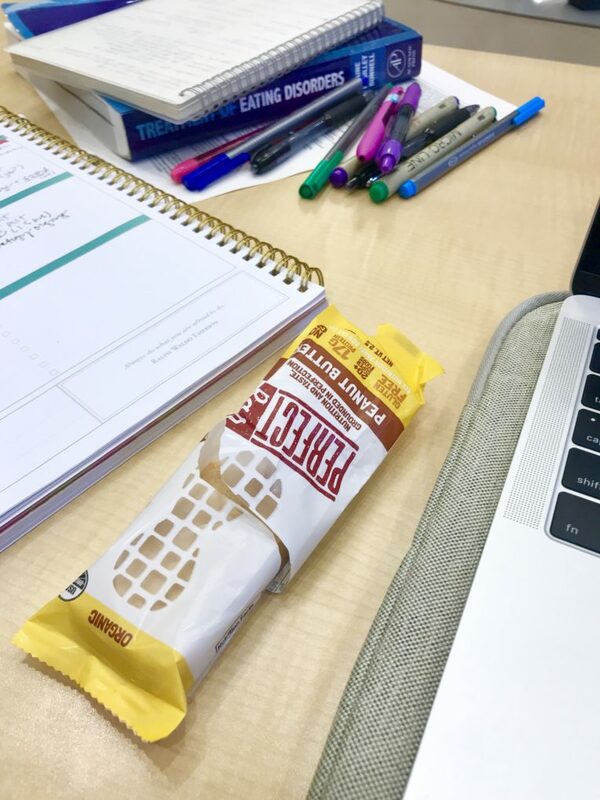 I’ve been loving Perfect Bars lately too for a bigger snack- sooo good paired with milk! 🙂 hope you had a wonderful weekend! I love the variety of things! Seeing your posts always inspires me to try new food combos. I also love seeing all the healthy fats! 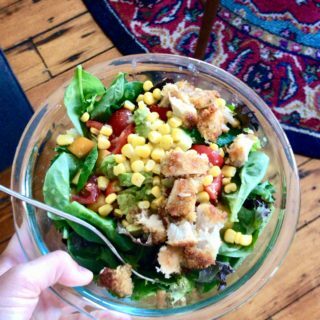 I’ve been trying to incorporate more into my meals. 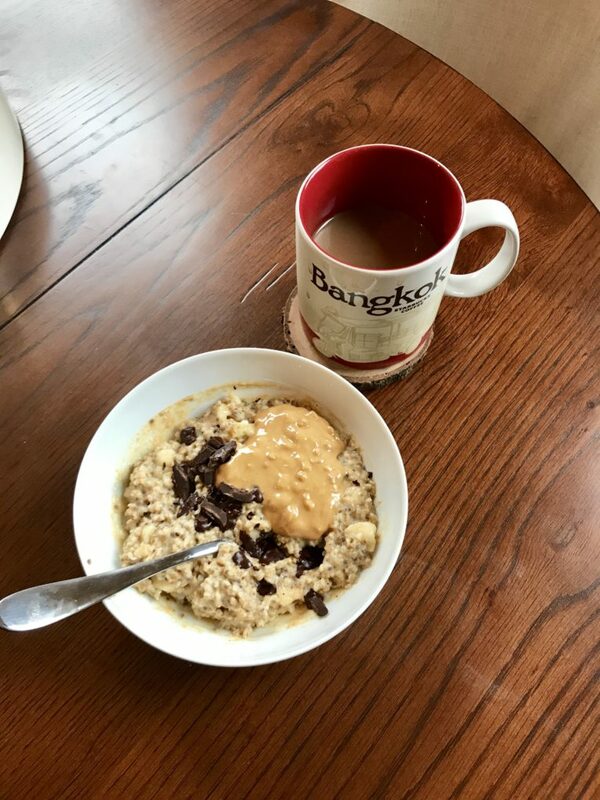 I really wanna try adding chocolate to my oats. 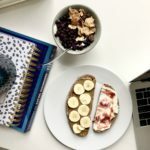 Along with the pb it sounds like such a simple and satisfying breakfast. I love having the freedom to enjoy chocolate any time of day 🙂 . I have the exact same favourite Larabars! Pb chocolate chip and chocolate chip are the best!